Planning dental treatment can be complicated, especially in the case of exacting procedures such as implants and their restorations. 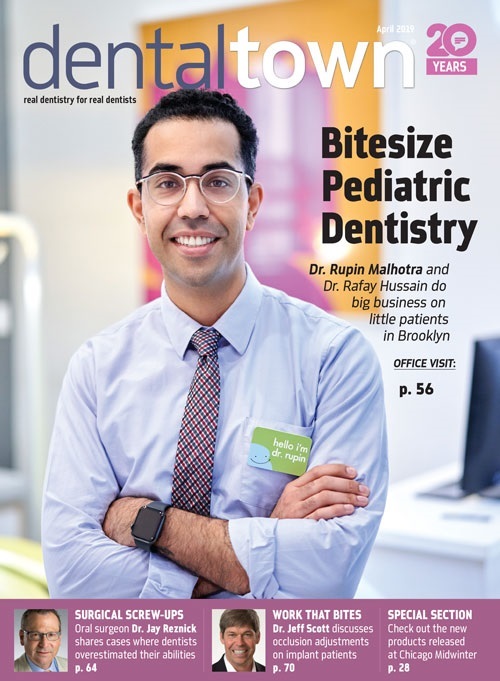 Knowledge of available space between teeth, measurements of bone and root angulations can change the course of treatment, and in some cases even preclude the need for surgery. To gain the detailed information needed to treatment plan and execute these procedures, practitioners are turning to cone beam 3D imaging instead of 2D radiography methods. I research all that I can about implants and value my colleagues' opinions on CBCT. I find that we share a common view of the benefits of CBCT. "The cone beam scan is very significant in uncovering anatomical conditions that would not be apparent on a 2D X-ray," said Steven Guttenberg, DDS, MD. "CBCT technology provides detailed, precise data in a 3D format that can be rotated 360 degrees, enlarged and sliced in any direction." Like Dr. Guttenberg, I have experienced inherent differences between planning in 2D and 3D. John Russo, DDS, MHS, offers, "3D imaging provides safety for my patients and confidence that I am formulating a good diagnosis before developing a surgical treatment plan." Utilizing cone beam scans in 3D imaging software can alert the clinician to potential complications prior to surgery, such as undercuts in the mandible or the need for grafts. As CBCT imaging becomes a part of more dental procedures, new treatment tools within software applications are being developed to make the processes even safer and more efficient. For example, using a program that provides the tools for complete treatment planning for both the placement and restoration of implants, including abutments and crowns, creates precision throughout the entire procedure. Fig. 1: 2D view of implant sites offering only a flattened, buccal-to-lingual perspective. Fig. 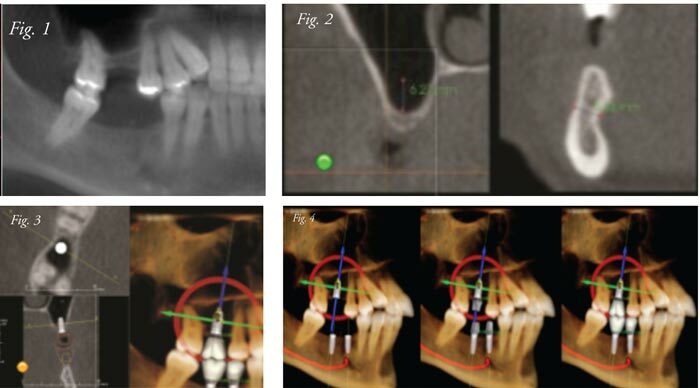 2: 3D cross sections showing the clear need for sinus augmentation and an undercut in the mandible along with precise measurements that aid in planning for these conditions. Fig. 3: Multiple and helpful views offered when planning implants in 3D imaging software. Fig. 4: Progressive 3D planning of implants and restorations. Credit: CBCT images taken with i-CAT Precise scan in Tx Studio, Imaging Sciences. Dr. Guttenberg notes having the right software is important, because of "the opportunity for integrating the scan with guided surgical techniques and other state-of-the-art applications." For one particularly difficult case, he sent his 3D scan to a third-party software firm that produced a stereolithic model of the patient's jaw so he could simulate surgery before working on the patient. All these options are made possible by 3D CBCT technology. As with any technology, it's not just about choosing a method; there are decisions to be made regarding equipment. In the case of cone beam modality, selecting a CBCT machine with flexibility in image size and lowered radiation exposure gives dentists the clinical control to respond to individual patient's needs while complying with ALARA (as low as reasonable achievable). Machines which offer low-dose scans while delivering a great amount of anatomical information are especially helpful maintaining this control. In many of my 3D imaging cases, such as follow-up scans where I want to monitor the healing of grafts, I can avoid over-exposing the patient by reducing the height of the scan to cover just the area needed. While 3D imaging allows implant cases to be quicker and easier, more importantly, it aids in patient understanding and helps build relationships with other dentists. I can plan most cases in a few minutes, from when I take the scan to when I start going over options with the patients. As I go through the software with them, they can see their own mouth in 3D and really understand why I suggested a particular type of treatment. CBCT's reliability is instrumental for case referrals. My colleagues send patients to me because they know I will use the 3D scan to place the implant as precisely and least invasively as possible. When placing implants, making the right decisions on size and placement is a matter of precision. The added dimension provided by CBCT offers the information needed to guide the dentist to a successful outcome. With cone beam technology, the dentist gains clinical control, efficiency, accuracy and confidence. Patients gain much more – an implant experience that they can understand and trust. Dr. Justin Moody is a graduate of the University of Oklahoma College of Dentistry. As a supporter of organized dentistry and continuing education, he is a member of the American Academy of Implant Dentistry, International College of Oral Implantologists, Academy of Osseointegration as well as the ADA, state and local societies. He is a diplomate in the American Board of Oral Implantology/Implant Dentistry and the ICOI, associate fellow and fellow of the AAID and holds mastership and fellow status at the Misch International Implant Institute. Dr. Moody lectures throughout the country on implant dentistry and is in private practice in Crawford, Nebraska. He can be reached at justin@the-dentalimplantcenter.com.